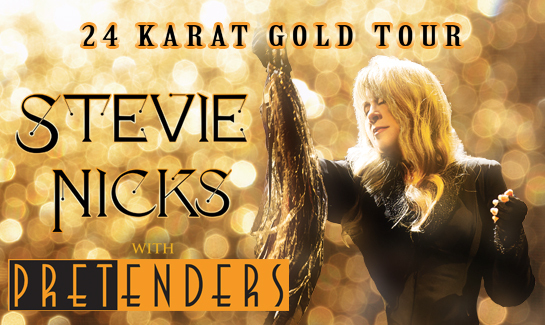 THURSDAY AUGUST 10, 2017 – Superstar singer-songwriter STEVIE NICKS today announced her return to New Zealand for an exclusive run of her 24 Karat Gold shows this November. Tickets will go on sale on Friday, August 18 at 1pm. The 24 Karat Gold Tour will include shows at Spark Arena, Auckland and Forsyth Barr Stadium in Dunedin. American Express Card Members will receive first access to tickets with a pre-sale starting 11am Monday, August 14. To purchase go to: amexinvites.co.nz. My Live Nation members can also be among the first to secure tickets during the pre-sale beginning 1pm Thursday, August 17. For complete tour and ticketing details including VIP Experiences, visit: livenation.co.nz. The Pretenders cross the bridge between punk, new wave and Top 40 pop music with unparalleled style, and with hit songs like Brass In Pocket, I’ll Stand By You, Back On The Chain Gang and Don’t Get Me Wrong. The 24 Karat Gold Tour brings together two of music’s most compelling women - a unique pairing that is not to be missed!